We are Sandy Hook Bay Marina. Come join us for a visit or the season. Welcome to Sandy Hook Bay Marina located on the shores of Sandy Hook Bay in the historic town of Highlands, Monmouth County, New Jersey. Whether you are looking for an overnight stay, a yacht club rendezvous or seasonal dockage, our premier port of call, located just 4 nautical miles from the tip of Sandy Hook, has been designed to delight boat owners, captains, crew and guests alike with state-of-the-art facilities, first-class service and concierge style amenities. If you are looking for a safe haven to enjoy boating in New Jersey, look no further. Our marina, with the completion of its reconstruction, was engineered and built to provide a secure, safe harbor for vessels of all sizes. We have new wave screens, bulkheads, floating docks, full length finger piers, deep water access and a basin depth of 6’ at mean low tide. The marina has 130 slips with 15 reserved for transient boaters and dock & dine patrons. Our amenities include full time dock attendants, onsite marina office, outdoor swimming pool, showers, ship’s store, barbecue area, fire pit and scenic landscaping. There are panoramic views from the private veranda deck on the 2nd floor of our iconic lighthouse building which houses the marina office. Complementing the marina is Joe Amiel’s Bay Pointe Inn, an upscale 5,400 square foot restaurant and café; and the Captains Bar, located on the outdoor deck adjacent to the restaurant overlooking the marina and bay. The restaurant serves local fresh seafood, lobster, prime aged steaks, homemade desserts and creative libations in a setting boasting panoramic views of Sandy Hook Bay, Gateway National Park and the New York City skyline. Whether you are dining out or just visiting the marina, stop by the Captain’s Bar, the place to be for cocktails, fish tales, boat loads of fun and live entertainment. If you are looking for a safe haven to enjoy boating in New Jersey, look no further. Our marina, with the completion of its reconstruction, was engineered and built to provide a secure, safe harbor for vessels of all sizes. We have new wave screens, bulkheads, floating docks, full length finger piers, deep water access and a basin depth of 7’ at mean low tide. The marina has 130 slips with 15 reserved for transient boaters and dock & dine patrons. Our amenities include full time dock attendants, onsite marina office, outdoor swimming pool, showers, ship’s store, barbecue area, fire pit and scenic landscaping. There are panoramic views from the private veranda deck on the 2nd floor of our iconic lighthouse building which houses the marina office. 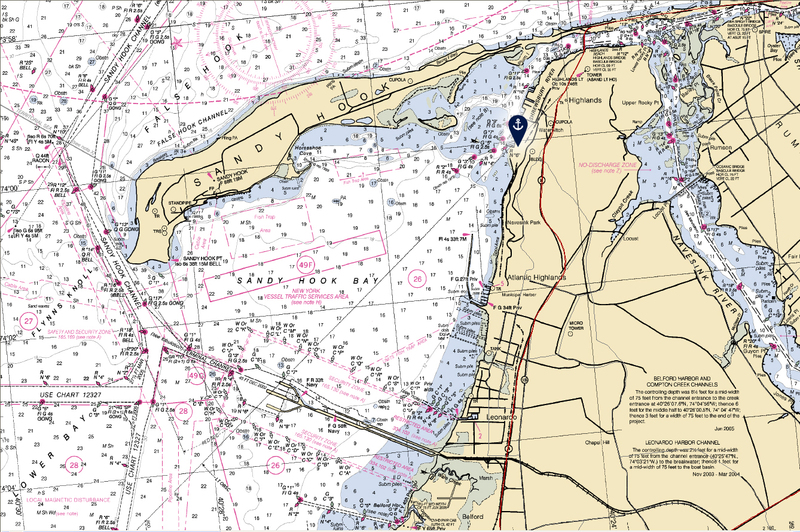 From the tip of Sandy Hook, steer a course of 180° to Red Buoy #6. Turn up to 120° and look for the entrance to Sandy Hook Bay Marina directly across from Green Buoy #7. From Garden State Parkway Southbound, take Exit 117 to Route 36 East. Follow for approximately 12 miles to Linden Avenue (see signs for ferry to NYC). Take the jug handle for a left hand turn and follow Linden Avenue downhill to the stop sign. Bear left onto Waterwitch Avenue and take the first left onto Shore Drive. Follow Shore Drive to the stop sign and turn right onto Willow Street. From Garden State Parkway Northbound, take GSP Exit 105 and travel east on Route 36 (turns into Joline Avenue) for about 5 miles. Take a left onto Ocean Avenue and follow north until crossing the Highlands Bridge (just past the entrance to Sandy Hook State Park). Follow Route 36 for another 1.2 miles until reaching Linden Avenue. Turn right at light onto Linden Avenue and follow to the stop sign. Bear left onto Waterwitch Avenue and take first left onto Shore Drive. Follow to end and turn right at stop sign onto Willow Street. Seastreak Ferry runs daily from New York. Visit www.seastreak.com for schedules. Bus Service from New York. Visit www.academybus.com for schedules. Bus Service from points in New Jersey, via Red Bank #834. Visit www.njtransit.com for schedules. The reconstruction of Sandy Hook Bay Marina was the result of numerous studies performed by professionals with expertise in marina planning, marine engineering and construction and consistent with our commitment to use sustainable products and environmentally conscious construction. The project won the Distinguished Engineering Award from the New Jersey Alliance for Action, which was presented to Matrix New World Engineering in April 2015 for the development of Sandy Hook Bay Marina. The reconstruction included state-of-the-art Sullivan Flotation Floating Docks, G electrical cable, pex water piping and lighthouse stanchions. These design standards are among the highest in the industry. The steel stake piles supporting the docks are 10” in diameter, 53’ in length and driven to a depth to avoid displacement during storms and from ice. The tops of the piles have also been set so that the docks will not override the piling even in the worst of storm events.